Grilled bacon wrapped tater tots are one of the most exciting tailgating recipes I’ve ever dreamt up. 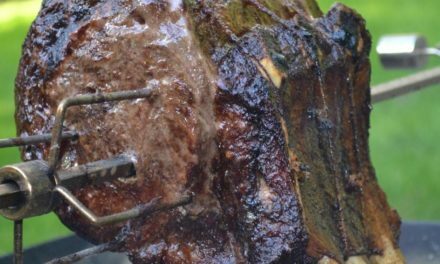 These can be prepared ahead of time and then tossed on the grill for any party. 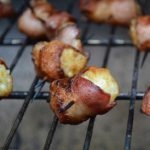 Bacon wrapped tater tots are tasty little treats will delight anyone who loves bacon and tater tots. I do not know too many people who do not love bacon or tater tots. These delightful treats literally cook themselves in the bacon grease and come out crunchy and flavorful. No deep frying to baking necessary. Grilled tater tots with bacon. The biggest problem I had making bacon wrapped tater tots was when I was prepping them for the grill. Since tater tots come frozen, the toothpicks would not penetrate the tots. I needed to either let them thaw out or find a quick way to thaw them. I decided to put them in the microwave oven for about ten seconds and see if the wooden toothpicks could penetrate the potato. This did work but you have to be careful because the tater tots get a little squishy once they are thawed. 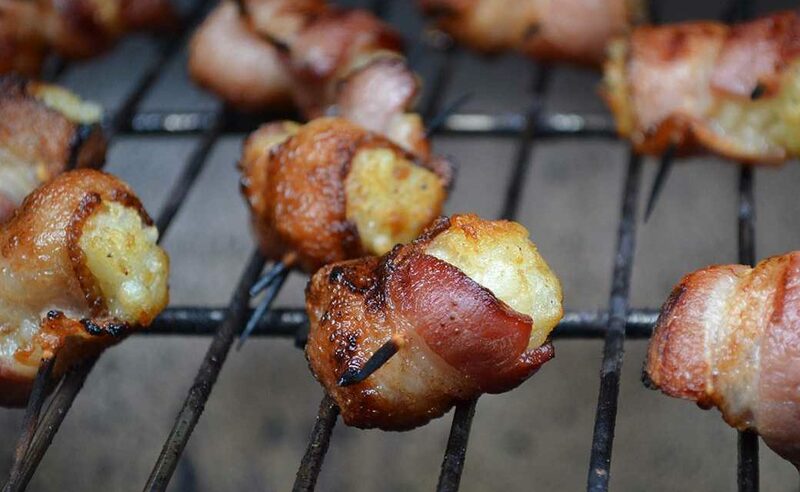 Grilled bacon wrapped tater tots. Cheese With Those Bacon Wrapped Tater Tots? When I first told a couple of family member’s I was going to experiment with this recipe, the first thing out of one of their mouths was, can you put cheese in that ensemble somehow? This was an intriguing challenge, but I had no idea if it would work. First of all, if you put the cheese just inside the bacon wrap, it would mostly if not entirely melt away. Then I thought about stuffing it in the tater tot, but considering how squishy the tater tots became after thawing it out, I had little hope this would work either. So if anyone has any ideas about how we could add cheese to this recipe, I’m all ears. Please comment below with your ideas. I would love to hear them. With football season come great appetizer recipes, try this one on your next football crowd and be the play of the game. Remove tater tots from the freezer and bag and let thaw out slightly. Alternatively, you can toss them in the microwave for about 10 seconds. Beware, the tater tots become squishy when thawed. Once the tater tots are thawed, begin wrapping each tot with the one-half piece of bacon. Secure the bacon with tooth picks. Be careful not to squish the tater tots when securing. Heat the grill to 400° degrees F.
Place the tater tots on the upper grill rack to cook slowly. The grease from the bacon will melt and flame up so be prepared to disperse the flame as you see fit. Turn every so often to cook the bacon thoroughly. Once the bacon is cooked the tater tots should be ready. This should take about 15 minutes. Remove from the grill and let stand for about a minute to cool. Serve immediately.